The second installment by sisterwife Elizabeth, pictured here with me at the Mendocino County Fair this weekend. 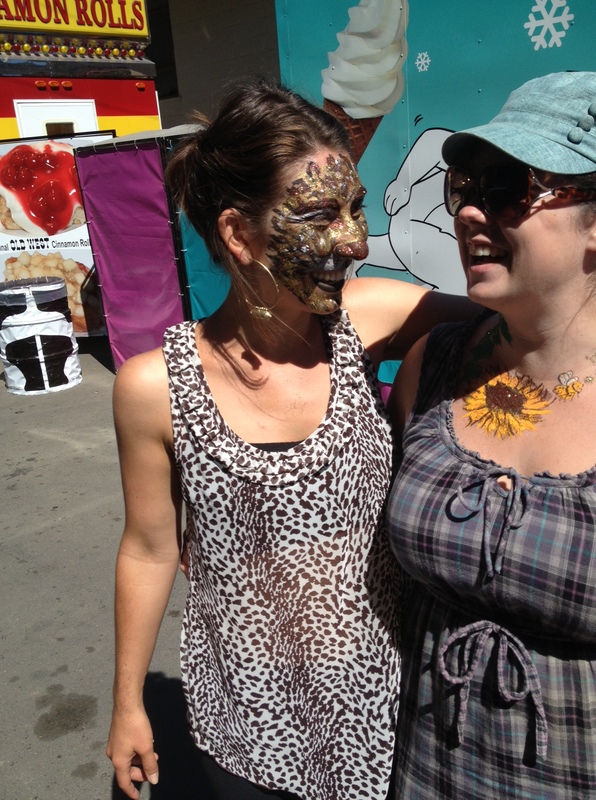 Because sometimes we are not in the kitchen and also, you are never too old to get your face/body painted. 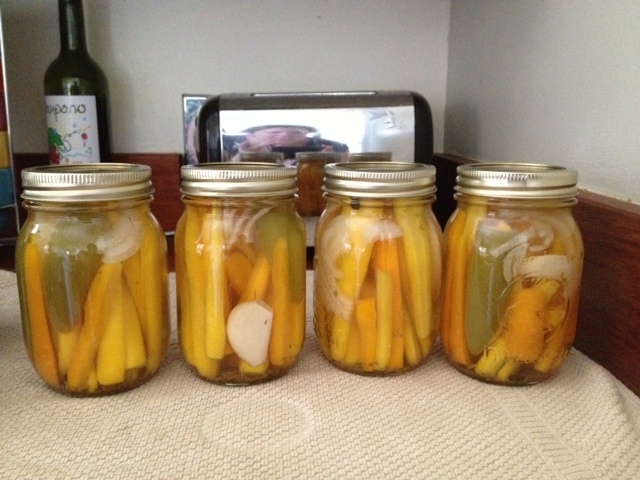 Preserving Food, Part II: Can It! Canning is not as hard as people think it is. It can be time consuming depending on what you’re making, but it’s not a difficult process. I didn’t even start canning by myself until this year, but I already feel like a natural. Last time, I wrote about making pickles. To make those pickles shelf-stable, follow these simple directions. (Not short, but simple.) Note that some foods are not safe to process in a water bath and need to be done in a pressure canner to be shelf-stable. Always check a recipe (or three) to find out if what you want to make is appropriate for the water bath method. 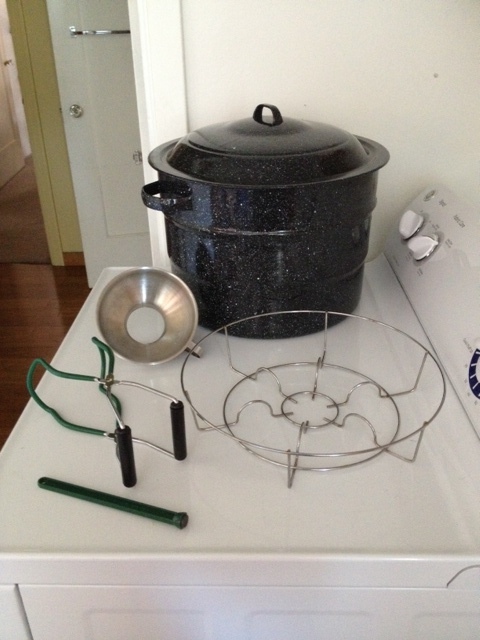 A canning rack or something that fits in the bottom of your pot (a round roasting or cooling rack often works). This is to protect the jars from the bottom of the pot and reduce the possibility of them exploding. Here’s how you do it. This applies to everything, not just pickles. 1) Prepare a water bath. Take your biggest pot and fill it so that the jars will be covered by at least 1 inch of water. Put the canning rack in the bottom, cover, and bring to a boil. 2) Put all your lids (not the rings) in a small saucepan with some water, and turn it to low heat. This loosens the rubber and helps form a better seal. These should sit in hot water for at least 10 minutes, but keep an eye on them – you don’t want them to boil. 4) Once the jars are filled with goods and you’ve added the brine (see Part I), use a chopstick to try to dislodge any air pockets. Add more brine if necessary. 6) Place the lids on the just-wiped-clean rims, add the rings, and tighten until they’re on pretty well but not so tight that your grandma couldn’t get them off. 7) Turn the heat on the water pot down so it stops boiling. This will help you not get burned. 8) Using jar tongs, gently place the jars in the pot. It’s okay if the jars touch, but you don’t want them to be so crowded that they won’t be able to move a little under the boiling water. If you have more jars to can than room in the pot, just do a second round. 9) Bring the heat back up to high, cover, and wait for it to boil again. 11) When the time is up, remove the lid and turn off the heat. Leave the jars in there for 5-10 minutes (if you take them straight from boiling water to room temperature, the jars are more likely to break). 13) A few hours later or the next day, press down on the tops of the jars. If they don’t bounce back, congratulations! You made shelf-stable food. Remove the rings and gently lift the jar off the counter a few inches by the edge of the lid just to make sure the seal is good. Store without the rings (so they don’t rust) in a cool, dark place. Conventional wisdom is that these are good for a year, but I’ve had 2-3 year old canned goods that were just fine. Always inspect newly opened jars with your eyes and nose when you open it. If it looks fine and smells fine, it’s fine. Do not open jars with bulging lids – this is a sign of botulism, which is very rare. 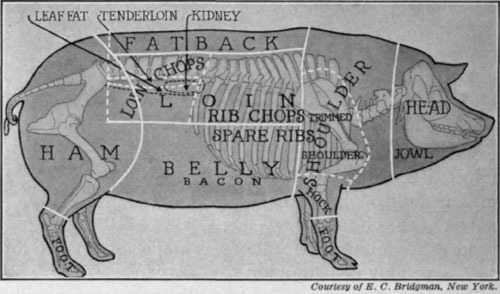 This is a good resource for more on canning and food safety. 14) If the lids do pop back when you press down, it’s ok! Just stick them in the fridge. There are many reasons a seal might not form, and none of them means the food is bad. If you have jars that break during the water bath, that’s a bummer but it’s not the end of the world. It happens sometimes, usually due to a scratch or other imperfection in the glass. It’s only ever happened to me once. All the other jars of food are still perfectly good, so remove them, let the rest of it cool, and then deal with it like you would any broken glass. This might seem like a lot, and at first it IS a lot. Think of it like playing Risk or Settlers of Cataan or some other complicated board game. The first time, it’s better to play with someone who’s done it before. But after a few times, you know exactly how to play and probably even feel comfortable teaching others. Also like a board game, canning is a lot better with friends. I’m happy to answer any questions you might have, and if you live in Mendocino county, come over any time for a lesson. 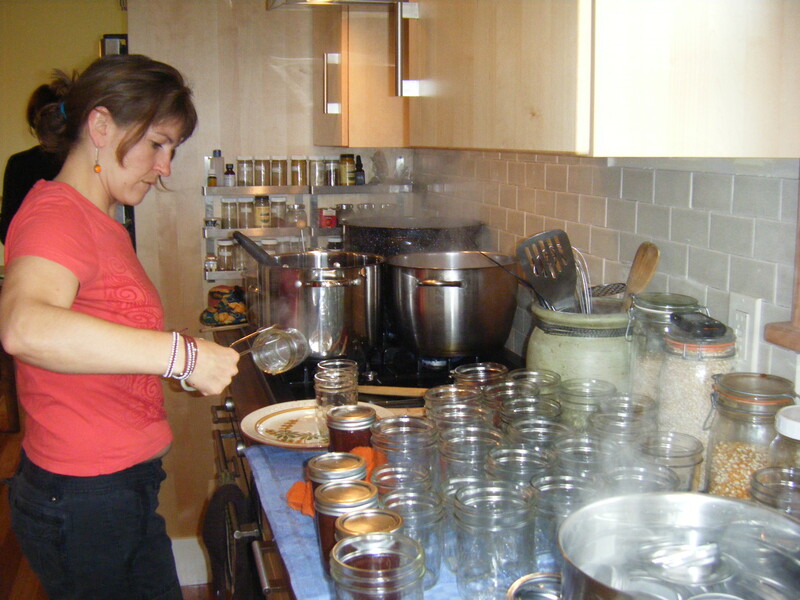 I’ll also be teaching a canning class in Ukiah in September. You can contact Elizabeth at her blog, My Ukiah. Categories: Cooking, Guest blog, Preserving Food, Recipes | Tags: canning, Elizabeth, how to can, instructions, pickles, preserving food | Permalink.